It's been a long fun month. Two summer festivals, Oregon Country Fair, topped off with the 2nd annual YSR West Coast Invitational! This is my first full "summer off" since 1975 and I have been getting all the mileage out of it that my body can endure! Motrin is cheap. I knew Thursday would be a busy day so I loaded everything up the nite before and drove out to Pat's Acres to set up the pit after lunchtime. Team Calamari was there and part of the Sacramento clan and some of the Canadians, so I just knew it was going to be a great weekend! I set things up then split to take care of the errands of life...including retrieving my repaired leathers from Jean Forsberg - thanks again Dragon! That evening I returned to a thriving chaos - lots of karters were there to get some practice as _we_ had the track the rest of the weekend, and lots more YSR teams were there setting up. I stuck around a while then took off to get my beauty sleep. After resting and bs'ing with all the YSR and WL people there for a while I went back out on the 50, which was sporting the Spawn of C'thulu bodywork for the weekend, and turned a few laps, got warmed up, then started having a great 3-way dice with some of the Calgary racers when braking hard into Six the rear end locked up and tossed me down Wham! The other guys nearly tossed it not running me over and immediately jumped to my aid but I was fine, just the usual bashes. But Spawn's motor was locked up solid, the dreaded seize having come to roost, bah. hot and tired, something I wanted to test out as endurance has been key against Formula80 bikes in the past, something I wanted to develop more. a lot of help from Ash, Chris, Sean, Roland James, Jonathan Fether, and Bob (of Wings R&D), we tore it apart, honed the cylinder, polished up the piston etc and reassembled it all. One thing about the YSR community is that if you ask for help they will give you their all, it's a pleasure knowing you all, thanks! However, on reassembly it wasn't sure that we'd cleverly dropped a circlip into the crankcase, though much fishing with a magnet turned up naught. After some final partying I went home to collapse. Saturday! Sprints! It sprinkled overnite, and I was surprised to learn one team from CA that I'd been looking forward to riding against had left in the middle of the night because of it! The track started out damp but by the end of practice was dry and good to go. I signed up for the GP80, Formula80 and Extreme YSR classes, but dropped the 50cc classes as when the moment of truth came and I fired up Spawn, it ran fine for about 15 seconds, went "clink!" and locked up solid. There's that circlip! :) Skipping these classes proved a good thing in the end though, as we will see. The EMT showed up late, so I was "it" for medical support throughout practice/qualifying but despite some huge 30+ fields in the 50cc classes and some memorable get-offs, there weren't any overly serious injuries, though Truman bashed his shoulder, and a Canadian racer wore a hole in his elbow, ouch. Once he got there the EMT and I pooled resources and things went smoothly the rest of the weekend. expressions on peoples faces as I raged around the track back to One where a multi-bike pileup had happened - outta my way, I'm the nurse! One racer's chimes got rung really hard, "No, it's not Prairie City, guess again!" but everyone was ok. On the restart I got a crappy start and big wheels just went "bye-bye"! I had a chance to try a TZ125/80 hybrid and discovered it is just as much an ergonomic torture-machine for me as the RS-hybrids so without developing a double-jointed spine it's an MH-80 for me, and I almost got Jim #70 to sell me his until he did so well (3rd place) on it he decided to keep it, drat! Then came the mains - in 80GP I got a good start and held on through the cluster of One with only a few bikes ahead of me - I knew I had someone breathing up my tailpipe (turns out it was Pete Neilson and #161 behind him), but I rode a good race and got faster as I went along, my fastest lap being the next-to-last, and I took 4th place! Formula 80 and Extreme YSR are only blurs to me now, as I'd given my all in the 80GP and while I rode fast I finished mid-pack in both, with slower times, as I was tired and sore but without the adrenaline to ignore it as I pretty much ran my own race with gaps in front and behind me and no big dices like earlier. Still, totally fun! Several longtime racers I respect came up and complimented my riding afterwards, which was really gratifying, especially after fighting through the impulse to quit the sport earlier in the year when I was having depression problems. 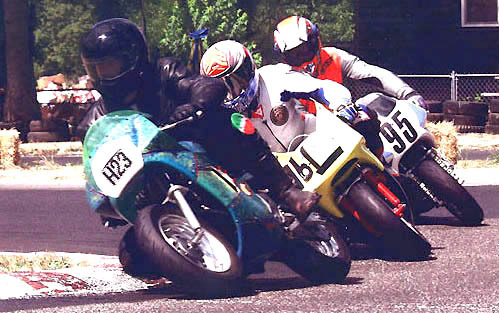 The 50cc fields were so big I'm sure I'd never had run so hard in the 80cc classes if I'd done both, so the motor problem became a blessing in disguise, and I was happy. After the post-race barbeque and awards I made the rounds for a while, watched potato-cannon action on some hapless lawn-flamingos then was home before midnight as I was spent. Was there a nekkid ride this year? Always sorry to miss a chance for minimalist rides...a sad commentary on how whupped I was is that I didn't even get in the hot tub, just showered and passed out. time before I can get them Web-paged. Enjoy! Then it was all over, the awards were given and while many packed to leave, the 4th round of the SuperTT series got underway! One word applies: "insane"! As the rain continued and the paved parts of the course turned to ice, watching Carl Blake, Tyler Sandell, Mike Deilke, Tony Callen, Pete Neilson et al slip, slide, crash & bash their way around Pat's was an over-the-top end to a fantastic weekend of racing!! It was great to reconnect with old friends, make new ones, have an uproarious time! Let's do it again! 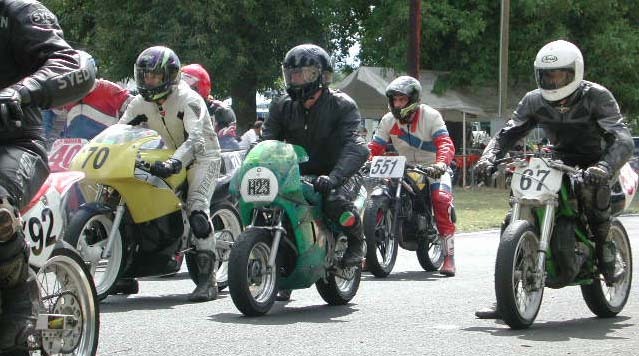 The next YSR races are NMRA in Canby on 18-19 Aug, followed the next weekend with PCYC in Vancouver BC - be there or miss out!